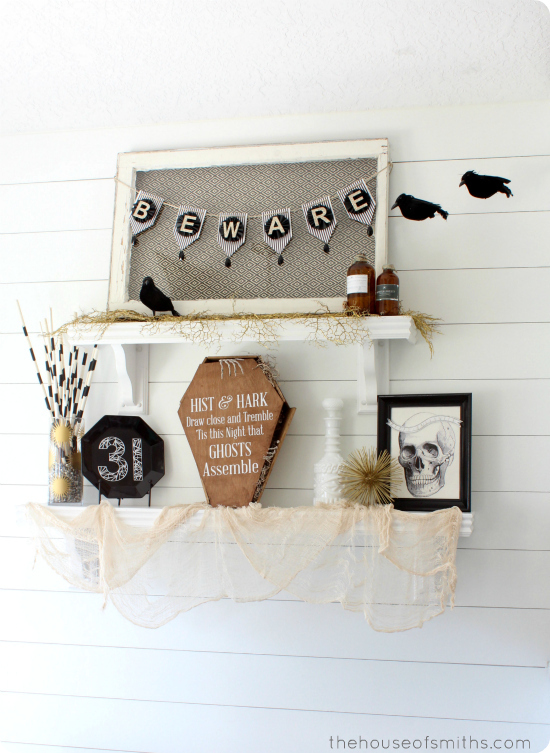 If you missed our last Halloween decor post, we showed off our spooktacular entryway, decked out with a plate wall, flying crows and even a box full of DIY potion bottles. And of COURSE, around here, no holiday would be complete without a little kitchen shelf decorating as well, right!? 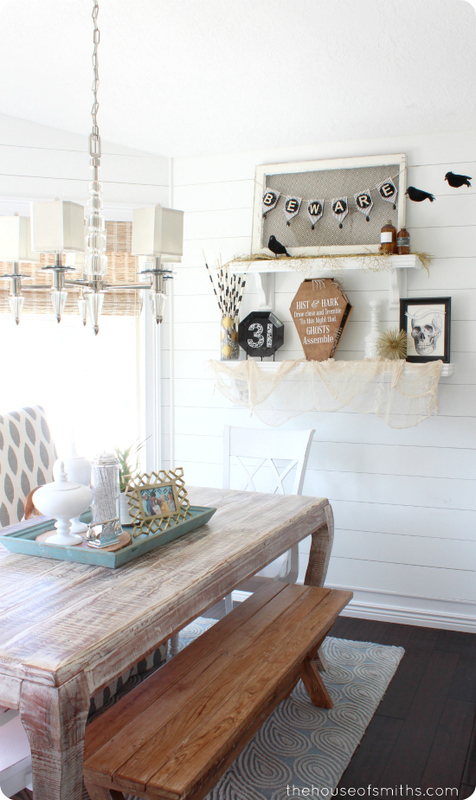 So just a few steps further into our home you'll find yourself familiar with a couple more Halloween touches. Like I mentioned before, I was shooting for a sort of "glamorous, art deco, Great Gatsby" type look this year. The details (gold, geometric, contrasting colors and jewels) are subtle, but combined together, I think I achieved the look I was going for! One of my first inspiration items was this gold coral spray from Zgallerie. It was originally on one long branch, but I cut it apart and spread it all the way across my top shelf. I added a single crow, but then wanted the appearance of other "friends" swooping in to join him, so with a few hook and eyes and fishing wire, I had Cason string a couple more from the ceiling to give the illusion of more birds flying in. 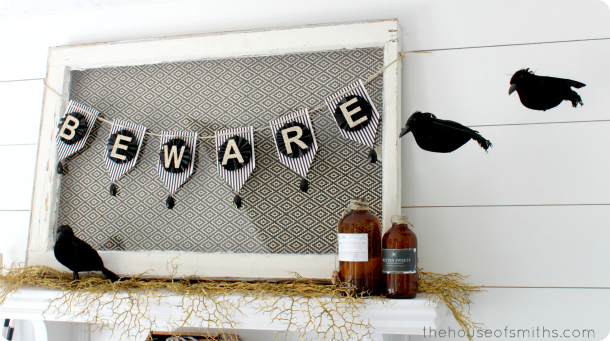 The BEWARE garland was sort of a DIY project. I actually picked up the original "halloween" banner at 80% off from a big home decor store, because it was torn apart and ruined pretty badly. 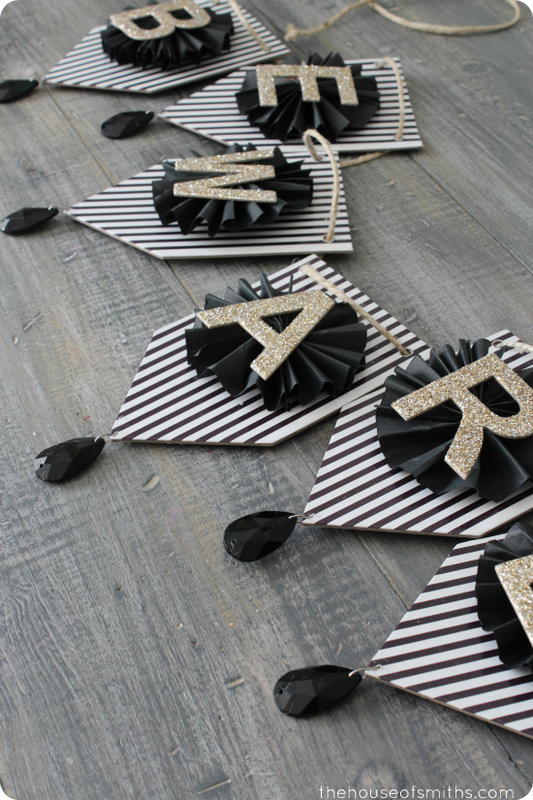 BUT, the thick, cardboard-like, striped banner pieces and most of the black pinwheels were still in great shape! So I just simply took the entire thing apart, reassembled it a little differently, and in no time had a new (and I think cuter/classier) banner, for only about $6.00! 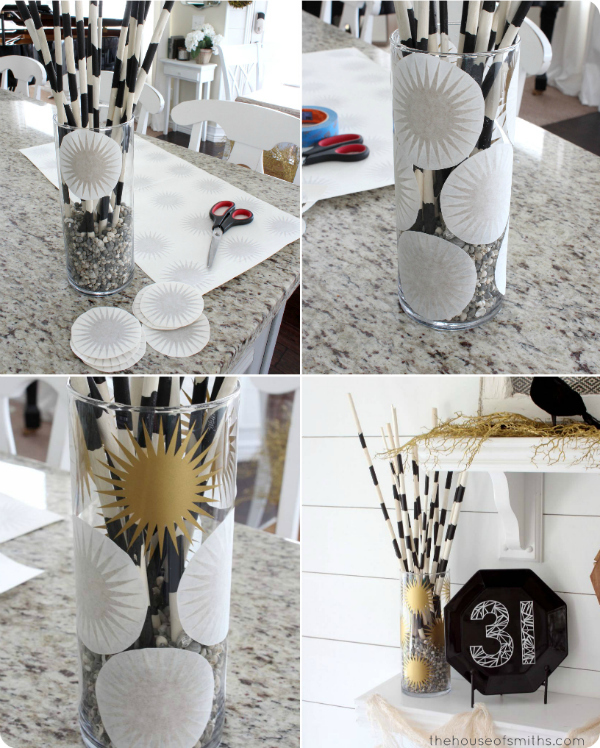 I reused this cylinder vase with tiny shells in it from two years ago, covered it in small, gold burst decals and cut some striped Ikea sticks in half to make a sort of modern arrangement, next to my geometric number 31 that I designed. 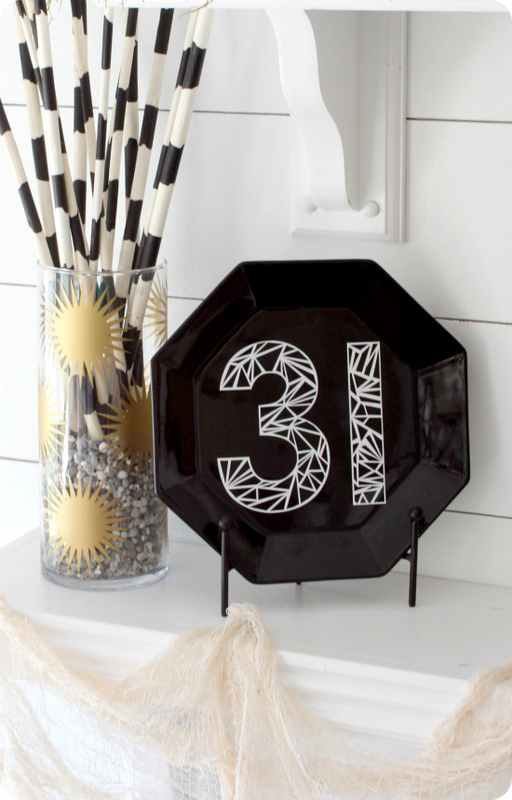 You can buy the small burst and geometric 31 decals in The House of Smiths Design Shop. 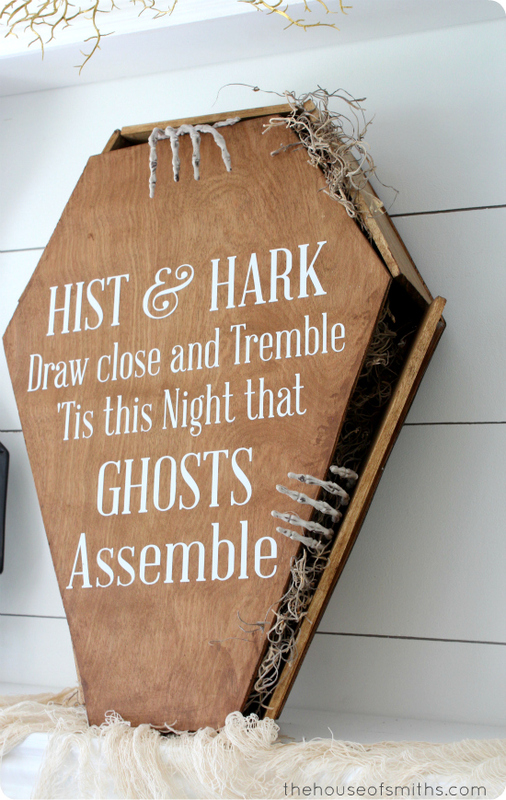 Our DIY creepy toe pincher coffin has GOT to be one of my most favorite pieces in this whole display. If you missed it, the tutorial for that is here. 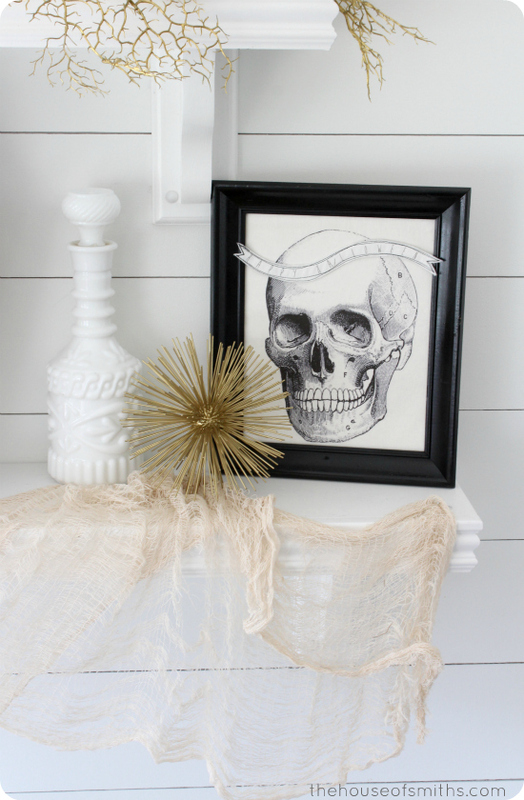 This awesome gold spiked sphere was something I splurged on at Zgallerie, the skeleton print was from a vendor at the Swiss Days fair and the large, ornate milk glass bottle was from DI (our local second hand thrift store) for $4.00. After draping some gauzy Halloween rags from Walmart to the bottom of our shelf, the look was complete! I love the black and gold look. I went for a little of that last year. This year is completely different as I'm 37 weeks early and have a scheduled C-section on the 25. 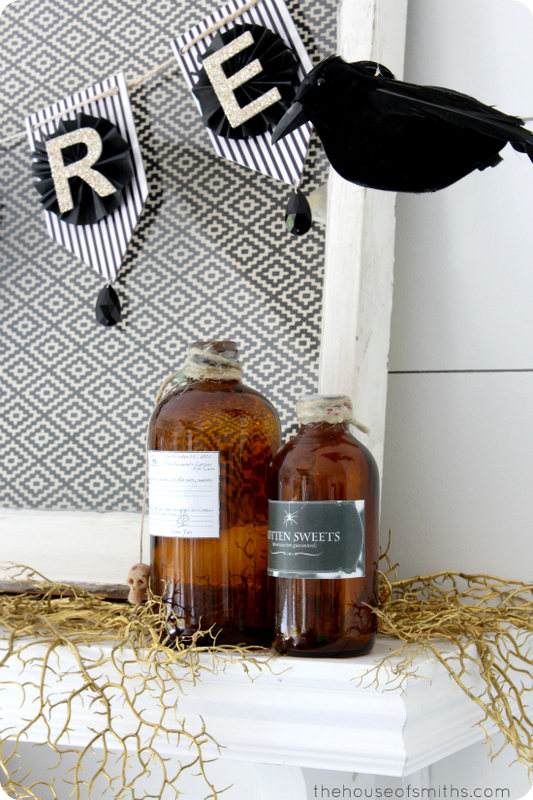 As much as my 4 year old loves Halloween (and we do too), I'm keeping it simple with pumpkins, gourds, and my mercury glass potion bottles. 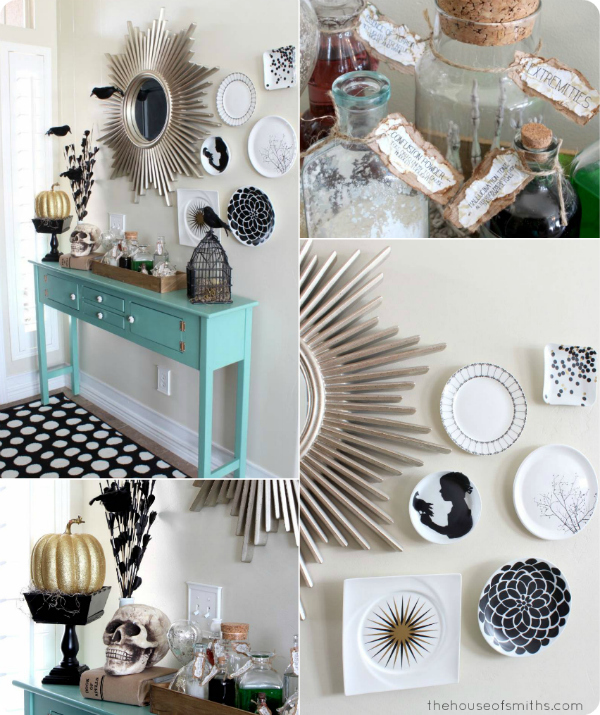 I'm normally not one to go all out on Halloween decor, but this post has inspired me! I love how classy it looks and the Art Deco flair you added. Where did you get your crows? I've been looking all over for some. Nice look! I really like the bunting. 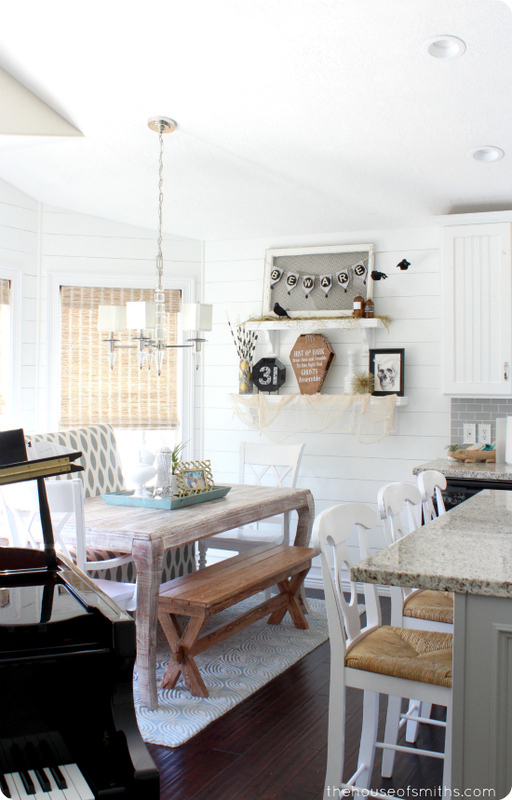 Btw, I love your light fixture over the table. I'm looking for something similar. I love this look you have going on! Can I come get crafty with you? 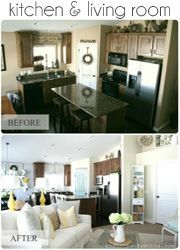 And by the way, I love your black and white rug below your console table. 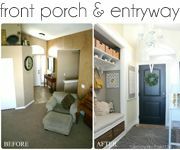 I loved the entryway decor and was totatlly inspired to do something similar myself. Thanks for the inspiration! 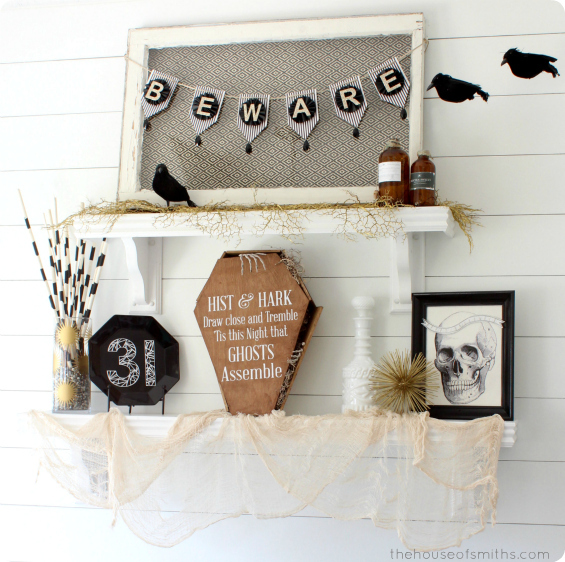 I love the entryway halloween decor and was inspired to do something similar in my house. Thanks for the inspiration! I'm totally going to steal your window idea. Thanks. I'm totally going to steal your window idea. Thanks! Love your Blog!!! Love this Post! 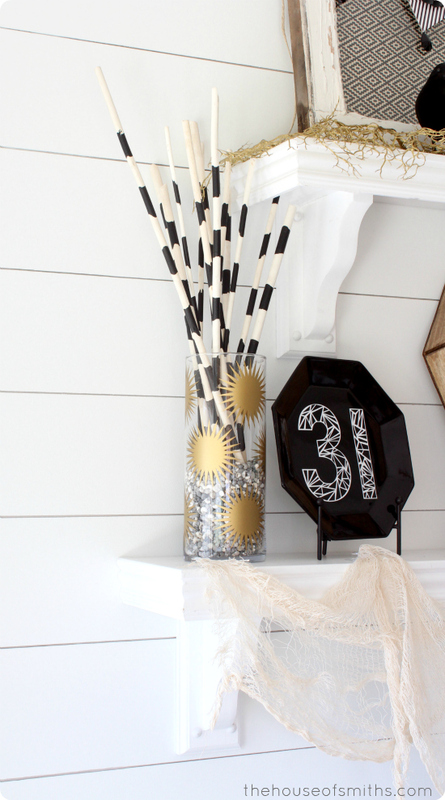 Your Halloween Deco with black/white, gold and turquoise are so 'Right Now!' Beautiful! I have been inspired! 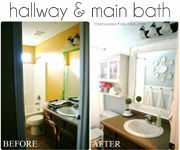 I LOVE the white paneling behind the shelf!! Can I ask how you did it or what you used?? I have never been to your site but I just spent the last 5 hours falling in love with your instagram feed! You are darling and simply the happiest person I ever seen:) I wish you were my next door neighbor...so you could rub some of the JOY off on me. 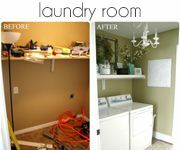 My husband and I usually hire things out...but I bought him a saw and some tools and we are embarking on a room makeover for our son. He is 6 and wants a surfer dude/shark room for his 7th bday! I think that paneling is exactly what I've been looking for!! I also have twins (16 months old) and his big room reveal will be on his bday in march...kind of a "big boy" room to make up for the last 16 chaotic months of his life having new twin babies join the family! I would love your insight! I feel like the paneling looks like a pier...or would be darling 3/4 the way up and then a bluish color above?? HELP! 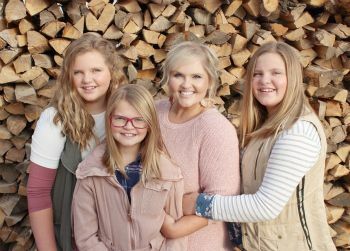 (I have known about your crazy talent for years....I grew up best friends with Chelsea Christensen and went to high school with Laci Davis!